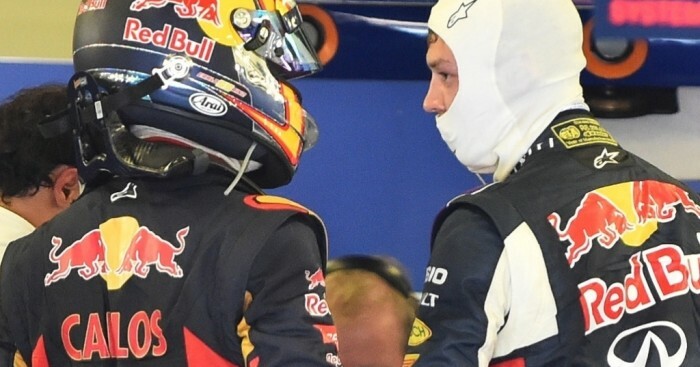 Red Bull are set to retain the same line-up for next season with Christian Horner revealing that promotion for either Max Verstappen and Carlos Sainz is a "year" away. The Toro Rosso youngsters have both been outstanding this season, impressing many in the paddock. Between the two they have scored 35 points to put Toro Rosso seventh in the Championship, a position that would be higher were it not for reliability issues from the STR10. Verstappen and Sainz's displays have led to some speculation that a promotion could be on the cards, especially as Daniil Kvyat struggled in the early races for Red Bull. But with the Russian racer finding his form of late, Horner says he expects both Red Bull and Toro Rosso will retain their same line-ups for next season. He told Sky Sports: "Inevitably there is going to be a concertina effect but that is probably a year away and it is good to keep all the drivers honest. "Investing in youth has proved to be tremendously successful for Red Bull with Sebastian Vettel and the two Daniels in our cars and with now Max and Carlos, two very promising young talents coming through. "For us, it is a great situation to have." The drivers won't be the only thing staying the same next season. Asked about Red Bull's engine supplier for 2016, the team boss insisted: "We have an agreement with Renault." And although there are some questions about the duo's relationship given that Renault are looking to purchase an existing team, Horner revealed his team will still get preference. He added: "The terms of the agreement that we are premium partners is quite explicit."